⚔ ☢ Serie på 29 amerikanske atmosfæriske atomvåbenforsøg i Nevada Forsøgsområdet i den første del af den kolde krig. Oplysninger om operationen er stadig skjulte som klassificeret eller maskeret information også selv om at forsøget er beskrevet detaljeret i Nuclear Weapons Testing at the Nevada Test Site, 2011. Atomvåbenforsøgene kom efter Project 56 og før Project 57. Dod: Declassification of Formerly Restricted Data, February 19, 2016. The John event (nuclear weapons test) conducted on 7/19/1957 was a W25 warhead on an air-to-air Genie rocket launched from an F89J fighter aircraft. The Frigate Bird event conducted on 5/6/1962 was a W47 warhead on a Polaris A1 missile launched from the USS Ethan Allen (SSB-608) as part of the system proof test. The actual yield of the Argus I, Argus II, and Argus III tests that took place between July 27, 1958 and October 6, 1958 was 1.7 kt. Ifølge operation Ranger 1982, 'In 1977, 15 years after the last above-ground nuclear weapons test, the Center for Disease Control noted a possible leukemia cluster among a small group of soldiers present at Shot SMOKY, one test of Operation PLUMBBOB, the series of atmospheric nuclear weapons tests conducted in 1957. Since that initial report by the Center for Disease Control, the Veterans Administration has received a number of claims for medical benefits from former military personnel who believe their health may have been affected by their participation in the weapons testing program'. Se tillige: Operation Anvil ; Aqueduct ; Arbor ; Argus ; Bedrock ; Bowline ; Buster-Jangle ; Castle ; Chariot ; Charioteer ; Cornerstone ; Cresset ; Crossroads ; Crosstie ; Cue ; Dominic ; Dominic II ; Dugout ; Emery ; Fishbowl ; Flintlock ; Fulcrum ; Fusileer ; Greenhouse ; Grenadier ; Grommet ; Guardian ; Hardtack I ; Hardtack II ; Ivy ; Julin ; Latchkey ; Little Feller ; Mandrel ; Musketeer ; Newsreel ; Niblick ; Nougat ; Phalanx ; Plowshare ; Praetorian ; Project 56 ; Project 57 ; Project 58 ; Project 58A ; Quicksilver ; Ranger ; Redwing ; Roller Coaster ; Sandstone ; Sculpin ; Storax ; Sunbeam ; Teapot ; Tinderbox ; Toggle ; Touchstone ; Trinity ; Tumbler-Snapper ; Upshot-Knothole ; Whetstone ; Wigwam. Institute of Medicine (U.S.). Committee on Thyroid Screening Related to I-131 Exposure, National Research Council (U.S.). 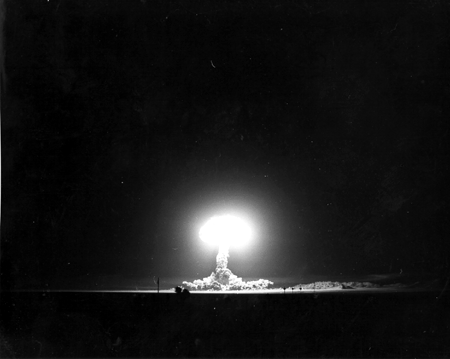 Committee on Exposure of the American People to I-131 from the Nevada Atomic Bomb Tests: Exposure of the American people to Iodine-131 from Nevada nuclear-bomb tests: review of the National Cancer Institute report and public health implications. National Academies Press, 1999 - 272 s.
Carl Maag, Stephen Rohrer, Robert Shepanek : Operation Ranger: Shots Able, Baker, Easy, Baker-2, Fox, 25 January-6 February 1951. United States Atmospheric Nuclear Weapons Tests, Nuclear Test Personnel Review, Prepared by the Defense Nuclear Agency as Executive Agency for the Department of Defense, 1982. 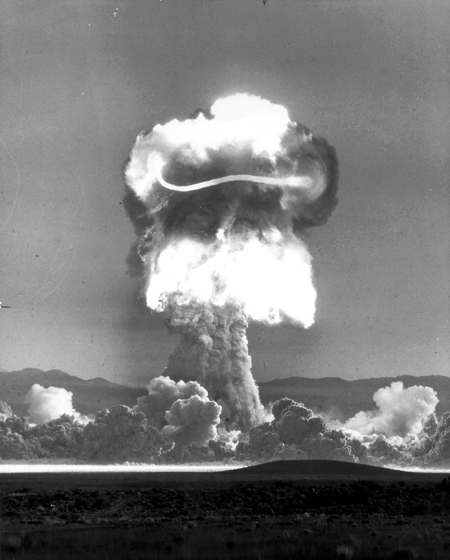 - 186 s.
Nuclear Weapons Testing at the Nevada Test Site: The First Decade. / John C. Hopkins and Barbara Killian. Defense Threat Reduction Agency, 2011. - 662 s.
Safety Experiments November 1955 - March 1958 : United States Atmospheric Nuclear Weapons Tests, Nuclear Test Personnel Review. Prepared by the Defense Nuclear Agency, 1982.- 82 s.
United States Nuclear Tests, juli 1945 through september 1992.